An Islam and the Humanities lecture and book talk, in Forging the Ideal Educated Girl, Shenila Khoja-Moolji (’05 A.B.) traces the figure of the ‘educated girl’ to examine the evolving politics of educational reform and development campaigns in colonial India and Pakistan. She challenges the prevailing common sense associated with calls for women’s and girls’ education and argues that such advocacy is not simply about access to education but, more crucially, concerned with producing ideal Muslim woman-/girl-subjects with specific relationships to the patriarchal family, paid work, Islam, and the nation-state. Thus, discourses on girls’/women’s education are sites for the construction of not only gender but also class relations, religion, and the nation. Shenila Khoja-Moolji (’05 A.B. ), is assistant professor of gender, sexuality, and women’s studies at Bowdoin College. Dr. Khoja-Moolji’s work examines the interplay of gender, race, religion, and power in transnational contexts, particularly in relation to Muslim populations. 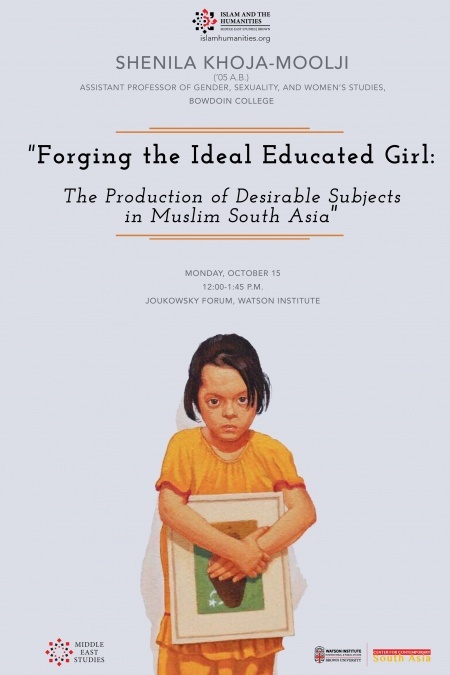 She is the author of Forging the Ideal Educated Girl: The Production of Desirable Subjects in Muslim South Asia (University of California Press, 2018). The book combines historical and cultural studies analyses with ethnographic work to examine the construction of the figure of the ‘educated girl’ in colonial India and postcolonial Pakistan. Her work has been published in Signs: Journal of Women in Culture and Society, Feminist Media Studies, Comparative Studies of South Asia, Africa and the Middle East, Gender and Education, Comparative Education Review, Girlhood Studies, and Feminist Teacher, among others. Dr. Khoja-Moolji also maintains an active public scholarship agenda and has published in The New York Times, The Washington Post, Al Jazeera, and The Express Tribune.